Hey, after six months, my son just bought more protein powder. He’s missing the shakes, and looking to put on bulk. He has his 6-month post-op on Friday, and gets his braces off in a month. Life is good. Christy, good to hear! He should have his full strength back by now and things will be looking up! I just went through double jaw surgery on the 18th of December (le fort 1, bilateral sagittal split osteotomy of mandible, bilateral mandibular bone harvest to bilateral maxillae, genioplasty). Before I decided to have the procedures done, I googled “double jaw surgery” and of course, your blog popped up (in addition to some news articles about South Koreans having double jaw surgery and then living with paralyzed faces or something). After reading the news articles, I was freaked out but then I read through your entire blog and felt much more comfortable with having the procedures done. Anyways, I’ve been on a soft, no-chew diet since day 1 (I guess my operation wasn’t as bad?) although I have found liquids to simply be cleaner and more convenient to consume than any soft food. One issue I ran into was having food stuck behind my splint. I assumed my saliva would “melt” away the food but surprisingly I woke up with a bit left still. After consuming more soft foods, more food got caught and to avoid having any infections, I decided to scrape it away with a bent wire. Well, the bent wire got most of the food out but now the back of my splint feels chipped. I wonder if my issues with the splint have to do with how I swallow now (inhale hard, push tongue against top of splint and swallow). Sometimes it feels like my roof muscles are squeezing the splint inwards. Did you have a similar experience with your splint? Thank you so much for the time you spent on your blog. I read it daily to compare my recovery to yours. It reassured me with the operation, and now it helps me a long with my recovery. I hope you are enjoying your new smile! Hey Graham,I had jaw surgery on the 4th of December and previously left a comment on your blog on the third day about all my discomfort and swelling! Well, my recovery is going really well now. I had most of my elastics except for those at the sides cut after the first week, so I could open my mouth and talk! However, 1/3 of my splint just broke and fell out, and it’s due to be removed in a week. Should I do anything about it or just live with this 2/3 remaining of splint in my mouth, since I’m having it out soon? Sarah, apologies for the delay in responding—we can blame Christmas travels! Your splint is now out, but my recommendation would have been to call your surgeon. I imagine they would have used some temporary glue to hold it together for those final few days. Happy Holidays! Fellow Edmontonian here. I love your blog. Who was your surgeon? I’m supposed to be going with Dr. Kevin Lung. Anyway, onto the main question of my post. You said your upper jaw was “widened quite extensively”. Can you comment on how much it was exactly? I’m a borderline case where I may or may not need SARPE along with Lefort. It all depends on how my teeth line up after the first go with braces. He was saying no more than 5 mm is usually acceptable with Lefort alone; any more and you need to go with SARPE. Andre, I honestly can’t recall how many millimeters my top jaw was widened by, sorry. It was enough that they had to put cadaver in to fill the gap. Also, my surgeon was Dr. Saranjeev Lahl. He’s a great guy—very kind, understanding, and professional. Enjoy Sunday in Edmonton! The smoothies did the job. The other day he was looking for something to eat and I said, “Have a protein shake,” and he said, “NO!” He’s finally eating real food and starting to think that maybe it was all worth it. Thank you for your blog!!!! I just had double jaw surgery 4 days ago. Initially i’ve been told by my surgeon that the surgery went well and that I am on the right track with healing. However, just 2 days ago on my second appoitment post-op (I requested for one because for some reason my elastics came off sometime during the day and it kinda freaked me out a bit). So after looking at my X-Ray my surgeon told me that he would need to do surgery on me again next week! It turned out that due to my blood loss, he couldn’t quite do the work on my chin and also couldn’t fit a segment of my jaw into my splint. Needless to say I was very upset. I don’t know who I should ask about this situation as I haven’t come across a similar case like this in the blogs I’ve read. Have you Graham? Huong, I’ve never heard of a surgeon being unable to complete the operation due to blood loss. The fact that you can have the followup surgery within the first few weeks is a good thing because your recovery time won’t be extended by much. However, the followup surgery should be free of charge because you paid for the final product. Let me know what becomes of this. My son is on Day 21. He’s been drinking smoothies made with Serious Mass Protein (like for bulking weight lifters) because it has tons of calories. I add an Activia yogurt to help with regularity, and sometimes throw in some ice cream. The smoothies taste good, and have everything in them he needs. The protein powder isn’t cheap (cheaper on Amazon), but it’s well worth it! Christy, I hope the protein-filled smoothies give your son the energy he needs to recover. We’ll see if he still likes them a month from now, haha! Your blog is so great, thank you for sharing:) I got my surgery on July 30th, and I’m feeling pretty good now compared to the first few days. One of the things that is bothering me the most is the horrible taste I have in my mouth, and the pain I feel behind my top teeth under my splint. I’m wondering if you have any tips on cleaning out the splint because I’m so frustrated! Did you feel a lot of pain under the splint right there? It would help me out so much if I could just get this splint clean. When you say your splint was off, in what way was it off? Cause when i try to bite down on mine, my bottom teeth don’t actually touch anything cause the back lip of the splint makes contact with the very back of my bottom jaw (if that makes sense–the gummy area behind my very back molars) so it sorta acts as like block. I’m scared to bite really hard, but I feel if I do I could probably get all my teeth to touch the bottom of the splint. Does that sound like something you experienced? I’m kind of paranoid right now that it might not be normal. Everything lines up though. Armen, when my splint was “off,” my bottom teeth no longer fit into the grooves designed for them. Certain splints may be different, but the one I wore had grooves where my bottom teeth were supposed to fit in. 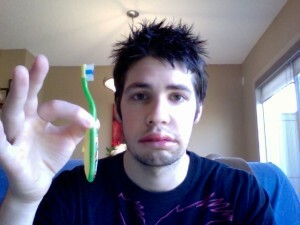 When it was out of position, my bottom teeth hit the splint before my mouth was completely closed, which hurt a bit. It was similar to biting down on really hard plastic, I suppose. 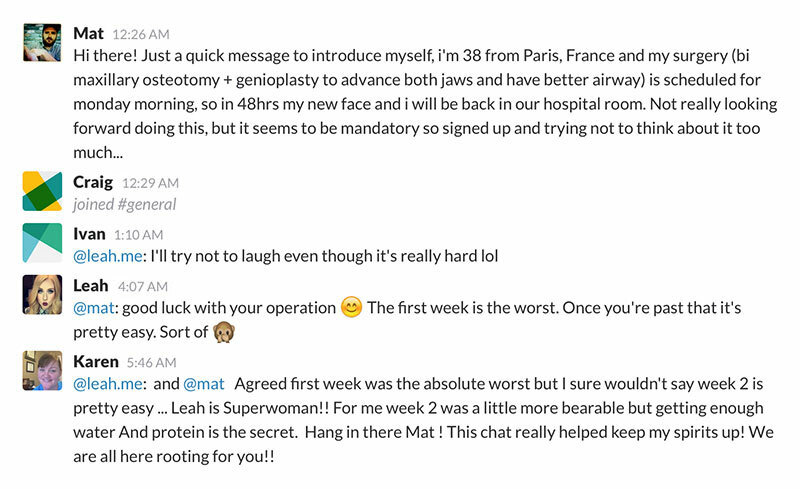 I’m day 8 after my surgery and it’s just amazing to see how different people react to the same procedure! I i stopped taking medication 3 days ago because i feel nothing and my numbness is only the tip of my nose, my top lip and a little bit on each of my cheeks! My swelling is also almost gone! I was just wondering if on the numb areas if you ever had the most annoying ticklish sensation ever! Because my top lip feels like its being tickled all the time, but scratching it does nothing! It’s the most annoying feeling ever! Although my hunger is crazy…my dad made a roast and i actually tried drinking the juices from it to see if itwas the same….it wasn’t, but only 4 more weeks and 5 days! Jade, the numb areas on my lower lip and chin are not ticklish. They simply feel… like they’ve been frozen at the dentist’s office. I reckon your ticklish sensation will go away soon. Let’s both hope so, otherwise you’ll be giggling for years to come! Mandy, when it comes to having an upset stomach, you can rest assured that it is quite common. If you need to vomit (and hopefully you don’t), you’ll still be able to do so with the bands on. Sadly, I don’t have any remedies for stomach illness immediately following the operation. Try to sleep it off, I guess! Hello. I wrote a while back on Sept 6th. I will be needing a second jaw surgery after all. My first surgery was a LaForte II. I will be having my second surgery sometime in January. My right side is candid and the doc also has to slightly adjust the bottom. It still goes over to the left a little but not bad. So the doc will so some “tweaking” as he calls it. One thing that I do not understand is why I did not get a split with my first jaw surgery (I had the upper widen) and I did not get rubber banded after the first surgery. Did not wake up with RB on. My husband said that when he first saw me in the recovery room, my jaw just hung open. Everywhere I read, people had splints! Anyway, the top healed just fine without it. Thank GOD! My question is this: I asked the doc to rubber band me after this second surgery to make sure everything heals properly. How long do I need to be rubber band to ensure proper healing? Second question: Do I still need a mouth splint this 2ND surgery along with RB’s to help things heal properly(this time)? I’m just having surgery on the lower jaw. I think it would help to train the muscles and to aid in healing of the jaw bone. I personally would like to be rubber band for 6 weeks to be sure everything heals properly. If anything my husband would enjoy the peace and quiet. ha ha ha. Mandy, if you’re only having your lower jaw operated on, you shouldn’t require a splint this time. You’re lucky you were able to heal so well without it the first time! I had my surgery 6 days ago, and I’m so glad I found this blog all the way from Johannesburg, South Africa. Really struggling with the food and looks like I won’t be eating for another couple of weeks (after reading this blog), was hoping to get my eat on around christmas:( but I guess it will all be worth it in the. Just need to wrap my head around the fact that this is temporary. Oh, and your positive attitude is infectious!! Love it. p.s. I was actually just in Africa a few weeks ago, though nowhere near your country. I was staying in DRC. If you don’t mind I’d love to throw in my two cents. I got my surgery just six weeks ago and this is my first year in College so I kind of understand the feeling. I, however, did not have a splint so this might not be 100% accurate. Well to start, I too couldn’t chew with my front teeth before surgery, I never even bothered trying because it just wouldn’t work. However, around the time that I started with soft foods I started trying. My personal suggestion would be that as soon as you’re able to eat a banana try biting it with your front teeth and even though it’s not quite the same as biting other food with your front teeth it will give you some practice (I wasn’t and still might not quite be able to open my mouth wide enough for a whole banana so i cut it up into slices and then bit those in half to practice with my front teeth. Currently I can bite fig newtons with my front teeth and pizza is on my list for after my jaw strengthens up. I would guess that in about 2 weeks-ish, you should slowly be able to use your front teeth. As for speaking, I think that now that you have the splint off your speech should improve rapidly. I’m 6 weeks out from surgery and I barely notice that my voice is off except for trying to make occasional s-sh sounds and I mix them up a little. hahahahaha shut up, you’re literally the same exact person as me. First of all… that’s the toothbrush I’m using, like not even kidding. Second of all… I dreamt about chinese food for like a week straight. One of my favorite shows is The Big Bang Theory and I watched it a lot while I was recovering down in Washington D.C. (where my surgeon is) because it’s just always on. And let me just say… that show is absolute f**king torture. They order in thai/pizza/chinese/indian/etc. EVERY SINGLE EPISODE. Also I got into a habit of muting the television whenever a food commercial came on. All I know is that I built up a bulk list of every food that I was going to eat when I got the splint off. Third of all… YES! THE LIPS! My lips still keep shedding. I’ve grown to just picking off the dead layers…. which is gross but necessary because the aquaphor doesn’t work unless all the dead skin is gone. I’m at the end of my 4th week and I just got my splint out a few days ago (a week early cause I live in Connecticut and the surgeon is in Washington D.C.). Like I had said, I had built up like a grocery list of all the things I wanted to eat and it’s kind of a drag because it’s my senior year in high school and I didn’t realize how hard it would be to relearn how to chew again. I ESPECIALLY didn’t realize how hard it would be to learn how to use my front teeth! I needed the surgery for a number of reasons, including sleep apnea and my small jaws, but the problem went further than just small jaws that were angled incorrectly. When I was younger I had a this awful orthodontist and I never liked him. Everyone thought I was crazy but I didn’t like him for reasons I couldn’t really explain, plus he always called me a wimp. Anyways he wanted to give me headgear for my “overbite” but I refused to wear it because I already had (and have) insomnia (I’ve been reading this blog because I couldn’t fall asleep :D) and the headgear wasn’t really helpful in the sleeping industry. So he gave me this like medieval dentistry that was called “herps appliance” and my surgeon was even shocked to hear that I had had herps appliance with small jaws and he suggested to my mom quietly (because he didn’t want her to bring it to court or anything) that the herps appliance only made the bite worse and could possibly be the cause of the open bite. And I believe him. The herps appliance only gave me TMJ and an open bite. So in the end I was right for hating my stupid orthodontist and we switched. ANYWAY, I’m getting off track (I tend to do that at 5:30AM in the morning. Sorry!!! Please don’t ignore this! I really would love for you to respond and help me.) So the moral of that story was that I once knew how to bite with my front teeth but then in about 8th grade I forgot how to. For like 4-5 years of my life I got used to cutting very hot pizza so the cheese wouldn’t fall off and then slightly shoving the crust into the back of my mouth so I could get a good bite and chewing on it there. I just don’t eat with my front teeth. I don’t remember the last time I ate with my front teeth and I don’t know when I’ll be able to. So two or three questions, and obviously our surgeries were different (I had to get braces again for mine and you didn’t. You had your splint for longer, etc. etc. Different surgeons, different ways of doing things) so I know you can’t exactly answer these perfectly for my case, but just let me know how it worked for you. First, how long did it take before you could chew like a normal person again. Like when did you get used to your new jaw and the new muscles? Second, and I don’t even know if this applies to you at all, how long did it take you to learn how to use your front teeth/how long do you think it will take me to learn how to use my front teeth?. Third, how long after you got the splint off did it take you to talk like a normal human? I am in a play in October… and this might get in the way if I don’t sound normal by then. Will I still sound as stiff or will I sound better but not perfect? Cause I can handle better but not perfect but I can’t handle just as stiff. THANK YOU FOR MAKING TODAY BETTER AND GIVING ME HOPE FOR TOMORROW. Please answer my questions!!! I’m happy to hear you’re a fellow Big Bang Theory enthusiast. I haven’t been watching any television during my travels, so I miss that show. I was able to chew like a regular human being about a month after I had my splint removed, which would have been around the 10-week mark. Since your splint came out earlier, you should be back to regular chewing by the end of the second month. Using my front teeth was a new experience for me as well. I figured out how to use them to actually bite through things like sandwiches and pizza at the same time as my chewing abilities returned—approximately a month after my splint was removed. If your splint is already out, you’ll sound much better by October. You may not sound perfect because you’ll still have some swelling, but you should be speaking quite clearly by that point. Dear Graham: releasing some frustration….I had jaw surgery when I was younger (too young-12ish) and it had receded. Back then I need to express that they wired the mouth shut and a totally different procedure back then. I am now 45 and in March of 2011, I had surgery to correct the first botched jaw surgery. Before this 2nd surgery my jaw was to the left and back towards the throat. I kept choking on food and something had to be done. So I sought out a doctor. I asked the doc before surgery if I would need to wear a splint after surgery to help train the muscles in there post surgery position. He said no. I was concerned of recession/or relapse after surgery since it has been approx 30 years since my first jaw surgery and muscles has ‘memory’. Finally to my frustration…I now have to wear a splint which I received last month in August 2012. I just wished that I had one right after my surgery in 2011. I’m just now getting one after all of this time? My jaw is now off horizontally where I bite and the teeth comes together on the left and not the right. Is it common not to have a splint right after surgery to help train muscles in there new position? I just felt it strange that I was not given a splint right after surgery. They widen the top and brought out the bottom and everything was PERFECTLY LINED UP AFTER MY SURGERY. NOW IT IS OFF~~???? I am really hoping that It is just the muscles pulling the jaw unnaturally. My left check would puff out due to the muscles cramping and pulling the jaw. Since my splint (which I have to wear ALL THE THE TIME – EVEN WHILE I EAT!) is to relax the jaw muscles. It is a thick retainer to keep my jaw in a relaxed state and for the muscles to learn there new position. Since wearing the retainer, I have noticed that the puffiness of the left cheek at the jaw line has gone down. I go in to the ortho and he would make adjustments on the splint. I would bite on carbon paper and the teeth would hit the carbon therefore marking the splint. They would grind down the splint in lighter areas to make the jaw bite better. Sorry for a long post, I’m just SO FRUSTRATED AND I WANT ALL OF THIS TO BE OVER WITH. I’m tired of a soft food diet! IF the splint does not do it’s job, I would then need just lower jaw surgery again! I go to see the orth tomorrow and I am going to ask him if he feels if I need surgery again. It may be to early to tell. So far every time I go in to have the retainer adjusted, they have to adjust it only about 5 times vs the first adjustment of over 15. (Bite on carbon, grind down, bite on carbon and repeat process). I can’t believe you had jaw surgery when you were only 12 years old. I can’t even imagine what the purpose of that would be since your jaw is still growing, quite rapidly, at that point in your life. You deserve to rant after all of the frustrations you’ve experienced. Some people seem to end up undergoing a bizarre series of treatments for things like jaw misalignment. I had this same problem Shannon. My “workaround” moreso was to drink lots of liquids during the day and then make sure that I used the prescription mouthwash right before going to sleep. I’m somewhere around day 35 and I still breath through my mouth at night because I have a bit of cartilage in my nasal passages that they couldn’t mess with because they moved my upper jaw. Basically, just make sure you drink lots of liquids and stay hydrated and use lip balm and it should help keep your mouth from drying out. I came across your wonderful blog and I’m hoping you can offer some advice. Today is day 9 after double surgery (I had an open bite with a receding lower jaw). My biggest issue is that I CANNOT sleep and I’m starting to go crazy. Basically when I try to fall asleep I breath through my nose and soon after my mouth opens (bc I stop clenching to close my bite) and I unconsciously switch over to mouth breathing. Then very quickly my mouth dries out and I wake up or can’t fall asleep period. Does any of this sound familiar?!?! My doctors gave me Xanax and that does knock me out for an hour or two, but I just wake up again with a super dry mouth. It all feels like torture and I’m just soooooo overtired and anxious. During the day I’m getting stronger and stronger and surprisingly do not feel sleepy at all. Shannon, I agree with Mat’s advice regarding your difficulty sleeping. Staying hydrated will help keep your mouth from drying out so quickly, but at the end of the day, it’s really a time thing. I wasn’t able to sleep through the night for about 1 month. Eventually, your body heals to the point where you can sleep comfortably again. Soon, my friend!